Robyn G, author and photographer of the blog, “Captivate Me,” hosts a photography/photo editing challenge each month called, “One-Four Challenge.” This week is the first week of four weeks of the same image edited four different ways. This is the image I will be working with this month. First, I edited it through Pixelmater to give the water a blue tint. Next, I edited in Aviary where I used the Enhance>Scenery and the High Definition and increased the brightness. Uh oh! It looks blue on mine. I don’t know what to do now. Guess try to fix it in the next one. Thank you for telling me! LOL! I am very limited on photos because I haven’t had my camera long. It is difficult to go out and get good photos now because it is so cold. Thank you! I just read a comment that one person was viewing the water as violet! Uh oh! Oh no! You are the second one that has told me that. Well, I guess for now the water is violet. LOL! I will try to make it blue in the next one. Oh good grief – I certainly make a lot of typos from my iphone! SORRY! ony ony was to say “on my” GRR! 🙂 Anyway – I saw someone had said that so I wanted to let you know it looked that way to me too – on my computer also – but it is STILL BEAUTIFUL! Kind of magical looking. If it looks blue on your screen, you might want to check your settings just for future purposes :). Hope you made out well today with your car. It was a day in the office for me and it is down to 17 degrees! BRRR! I would love to see you join this challenge. This is week 1 and week 1 just started. This will be a great chance for you to learn the photo editing (I think you said you aren’t familiar with that). I wasn’t either, but I joined anyway. It’s beautiful, the water looks like glass! Oh Elizabeth, I have had several people tell me the water is the color of violet. It looks blue on my iPad. There isn’t anything I can do about it this week. Next week I will try and fix it. Looking forward to your next edits with this lovely fellow. Do what you can with what you have – if I’m viewing my own work on my iPad, it varies considerably compared to my computer monitor. It’s just something for us all to be aware of and allow a bit of flexibility where this is concerned. Thank you Robyn. I was horrified to learn it is showing violet. Your words are kind and I appreciate them. 🙂 Hugs! An interesting picture and effect. It willbe interesting to see where you take it next week. Thank you Cat! The water will have to stay purple for this week but I’m happy to learn it doesn’t look bad. Haha! I did like the way it brought out the duck (which looks blue. haha!) I’m laughing now and if I don’t stop I will spill my coffee. That’s true! Did you get my email? Love the photo! Yes, its a regal shade of lavendar and there seems to be a problem area surrounding his leg/foot. Perhaps that just my phone distortion. Sounds like a fun challenge though! Oh dear! Another problem, the leg. I’ll have to look. This is getting hilarious. Seriously, I have been laughing so much this morning I have almost spilled my coffee. Lavender (violet) water, blue duck, and a leg problem. Hahaha!!! Sounds like MY LIFE right now! Lets just say its the duck from Oz. hahaha!!! 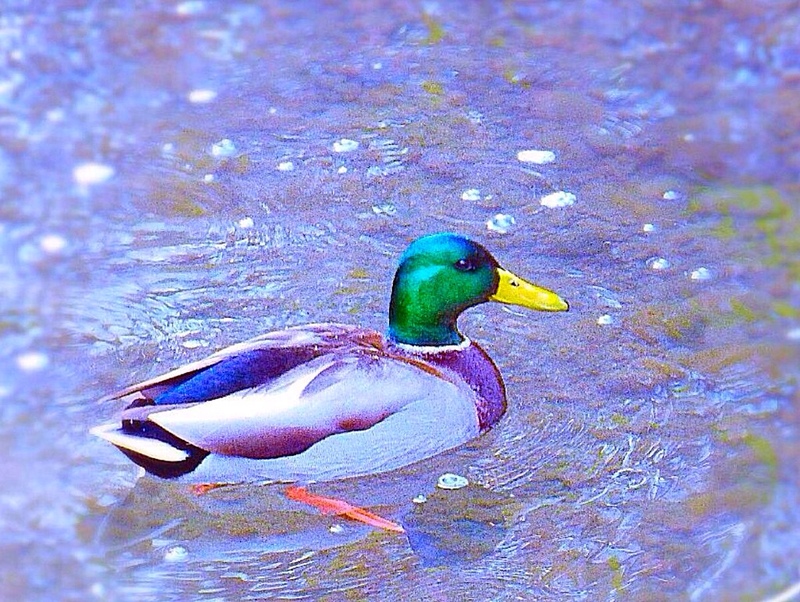 Beautiful job on the duck – I love the colors and the effect on the water. Thank you. I edited it on my iPad and everyone has been telling me the water is violet. It looks blue on my iPad. In fact, I liked the look of it (on my iPad). I don’t know what it looks like on a larger computer. I looked at it on my ipad and large computer screen, and the water looks bluer on the ipad and more lavender on the computer. Probably due to different color calibrations. I would be interested to know how best to deal with this, if a solution exists… Although there are so many different monitors that it may be futile! Still, nice work! This Mullard Duck has stunning colours. The water is a little ‘unreal’, with the mauve tint, but the patterns are lovely. What a great subject… look forward to the next weeks’ edits! Haha! You are about the 4th person to tell me the water looks, violent, lavender, and now mauve. I did the edits on my iPad and the water was blue on my iPad. Apparently the laptops and desktops are showing the water purplish. Yes, I am wondering how I am going to get to look more natural now. Oh by the way, Thank you! It is a lovely image anyway, and I reckon “intent” is what matters! I love the effect of the colours here- like a water colour! !